Karur Vysya Bank Recruitment 2017 – Apply Online for Probationary Officer Posts:- Karur Vysya Bank (KVB) has published latest notification for the recruitment of Probationary Officer (Scale I Cadre). Desirous & eligible candidates can apply online from 09/06/2017 to 19/06/2017. Age Limit: Maximum 28 years. Candidates should have been born not earlier than 01/06/1989 and not later than 31/05/1999 (both days inclusive). Educational Qualification: Post Graduate Degree (10+2+3+2 or 10+2+5) or Double Degree holders (10+2+3+2 or 10+2+3+2/3) or B.E.,B.Tech. B.Sc. Agri. (10+2+4) under regular course from a college affiliated to a recognized University with 60% of marks and above. Candidates who are appearing for the final semester of their Post Graduation – PG from a college affiliated to a recognized University (final exam in May / June 2017) can also apply with aggregate of 60% marks and above without any standing arrears at the time of applying. Any Degree / P.G. obtained through Correspondence or Open University is not eligible. Starting Date of Online Application :09/06/2017. Last Date of Online Application : 19/06/2017. Online Fee Payment : 09/06/2017 to 19/06/2017. Last date for printing your application : 04/07/2017. Application Procedure : Eligible candidates can apply online through the website http://www.kvb.co.in from 09/06/2017 to 19/06/2017. 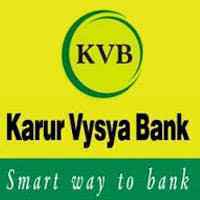 Subscribe our free job alert mail for Karur Vysya Bank Recruitment 2017.